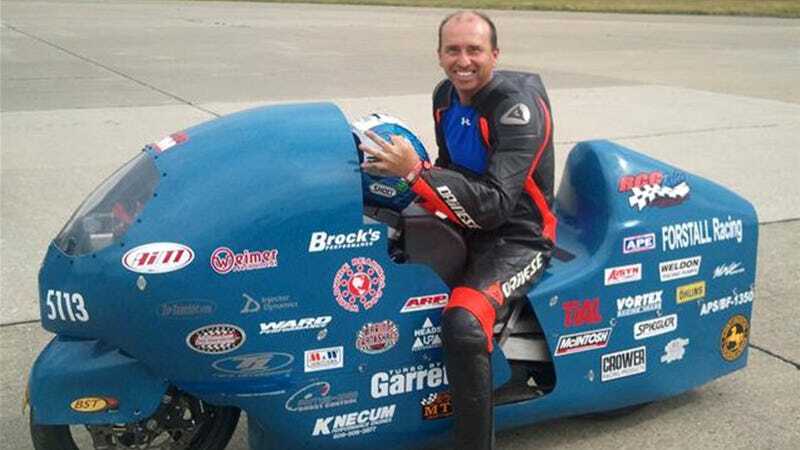 Very sad news out of Florida for gearheads everywhere as Bill Warner, a motorcycle racer who once hit a record speed of 311 mph, crashed and died during a high-speed run on Sunday. Warner, 44, clocked 285 mph at Loring Air Force Base before he lost control and veered off the runway in his his modified Suzuki Hayabusa, the AP reports. In 2011, Warner set a land-speed conventional motorcycle record of 311 mph at the base using 1.5 miles of runway. On Sunday, he was attempting to top 300 mph again, this time using just one mile, according to news reports. About 400 people watched Warner veer right after passing the one mile mark. He traveled upright for about 2,000 feet before veering off and crashing. He was conscious and talking after, but died an hour later at an area hospital. The remainder of Sunday's event was canceled. "No one will touch Bill's achievements or be the type of racer he was. He was a personal friend and the land-racing community is less for his loss," Tim Kelly, race director of the Loring Timing Assn., said. Awful news. Godspeed to you, Bill.